Sportsmobile is one of the most flexible and open minded camper van conversion team to be found on the market. Being in the business since 1961, makes them the oldest and most experienced manufacturer in North America. 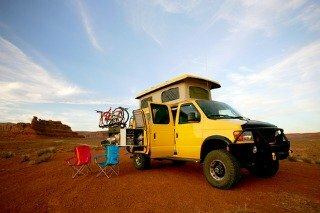 Based on the Ford, Chevy/GM and Mercedes-Benz vans, these guys not only perform camper van conversions, but can convert their vehicles for many other uses as well. 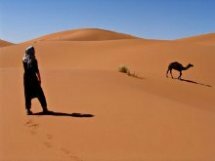 Rescue, research, photography, sports and many others are the words that come to mind, especially when the tough and adventurous 4x4 camper vans are in order. 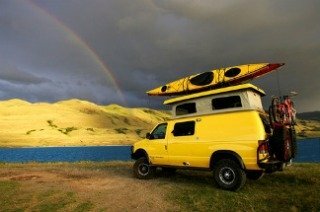 And their 4x4 camper vans are one of the best ultimate adventure rigs around, ready for any kind of action. Equipped with beefy tires, aluminum bumpers, solar cells and anything else you could possibly think of, it can be your perfect home away from home. 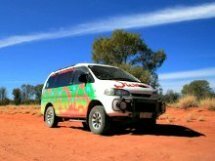 So if your looking for a serious all-purpose off road camper van, this is definitely the one to consider. 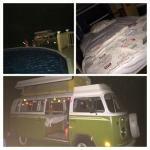 Click here to share your adventure van with other visitors to this page! Now this is the fun part that makes everything so unique! 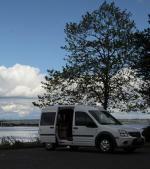 The company can provide the basic van or you can get your own existing van converted any way you wish. After selecting the basic van, you have different roof options. A pop-top or the Penthouse with an extra double bed on the top and a few different kind of hard-top roofs. There are more then fifty floor plans or interior designs to choose from, but you can make any kind of combination to satisfy your needs at no extra cost. 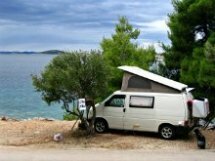 Anything from a minimum van conversion to a fully self-contained van camper. The long list of options definitely has something for everyone. And if you can't visit them personally, you can get all the work done on-line using their website. It's like playing with module blocks, to help you get a better understanding how the inside of your home on wheels will look like. Timeless interior designs are very clean, simple and functional. Cupboards, closets and fully equipped kitchens. A cozy and homy feeling, that's for sure. The options department is again a choice of your own. You can equip your van from the long list of options available or just delete the ones that are standard. 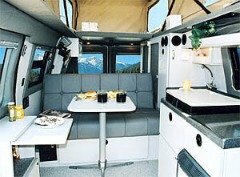 At Sportsmobile, they leave your mind and hands free to design and equip your camper van to satisfy your needs to the best. You can even drive in your own van, have the pop-top roof fitted and just build your own camper back home if you want to. 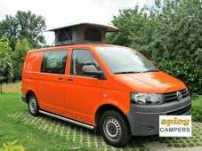 They will assist you in any way possible and sell your used camper van if you wish so. And of course, there is a owners forum, social club and the 4x4 rallies, where you can meet folks like yourself. The socializing part of the adventure life, if you know what I mean. 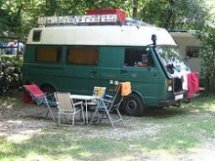 After all, these camper van conversions have many costumers around the world which appreciate the quality and durability of these campers. Touring Around In A Sportsmobile? Click here to see the rest of the form and complete your Sportsmobile review. It's a 1992 Ford E250 SportsMobile 4x4 Panel Van!